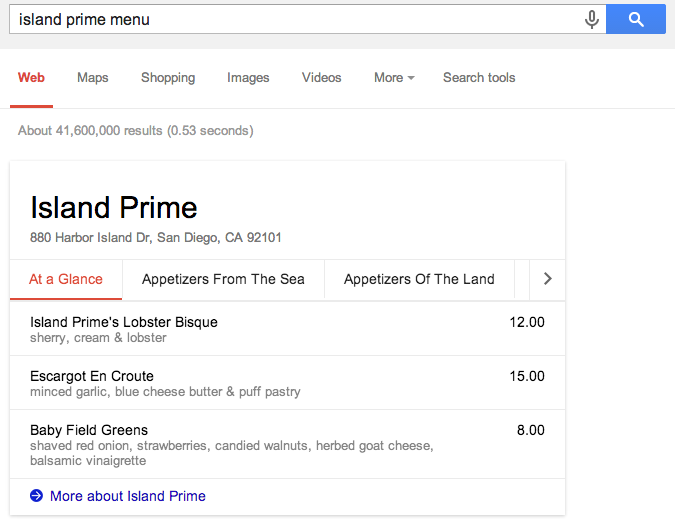 If you’ve searched for a restaurant menu on Google in the past week or so, you may have noticed something different. 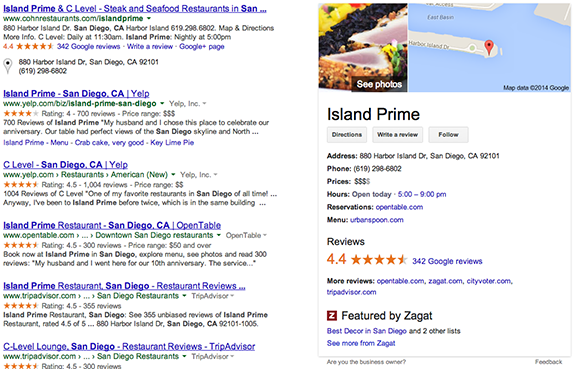 As of last Friday, menus are now being displayed directly in search results pages, rather than requiring searchers to click through to a restaurant’s website or third party review site such as Yelp. So far, the feature has only been deployed in the U.S. Restaurants with more robust menus feature tabs with different sections that you can click through to see drinks, wine lists, appetizers, main courses, desserts, and more. You can also click on the “More about” link at the bottom of the menu; this opens a new page of search results that includes the business’s Google Local information in the right frame. Where is this menu data coming from? Google partners with a few third party menu providers, including SinglePlatform, who aggregate and distribute menu information for thousands of businesses across the U.S. While Google is just pulling in basic menu item information right now, there’s great potential to do more with these menus by enhancing them with rich content such as photos, specials, announcements, and coupons. For restaurants and other businesses with menus to share, this new feature provides a great way to engage online consumers who are searching specifically for their menu. However, the feature isn’t very useful for users who don’t have a specific restaurant in mind—a more general search string such as “Italian restaurant menu Brooklyn” yields no menu results from Google. Review sites and apps that specialize in restaurant listings still have an important role to play in helping consumers discover new local businesses. If you don’t see a menu for your business in Google’s results, or see a menu that’s out of date, never fear: SinglePlatform can create a menu for you or update your existing one! Find out how on our website.